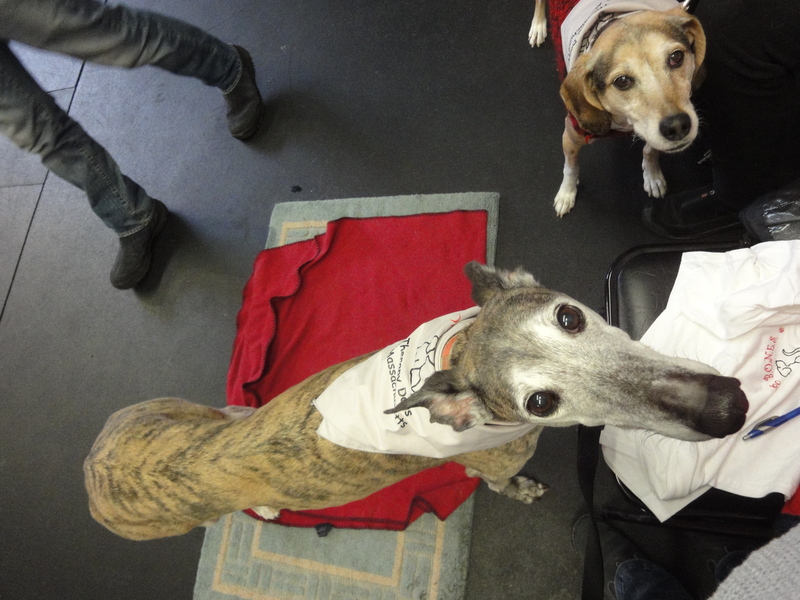 The first I heard of therapy dogs in libraries was through the Library Link of the Day in July 2012, which was a short article (“Therapy Dog Helps Children Learn“) about a retired racing greyhound who visited libraries, nursing homes, and rehab centers. I sent it to a co-worker, who asked if I knew that “Lucy the READ dog” was visiting our main library and branch that very week? I had not known. It turns out that dogs visiting libraries in order for kids to read to them or otherwise interact with them is becoming more and more common. Earlier in 2012, Library Journal posted a piece called “Therapy Dogs’ Presence Steadily Grows in Libraries.” Meredith Schwartz wrote about a public library in Wisconsin that welcomed Reading Education Assistance Dogs (READ); children participated in the “Read to a Dog” program to improve their literacy skills. A study at Tufts University showed that reading to dogs helped kids improve more than reading to humans. Colleges and universities have also begun bringing dogs in during finals week to help students de-stress by spending time with animals. In a public library in Ohio, the Tail Waggin’ Tutors (handler/dog teams from Therapy Dogs International) visit the library once a month. The dogs are non-judgmental listeners, who are able to give children an un-intimidating environment for reading practice. They don’t interrupt or correct, and some of them are even happy to cuddle. (“Therapy Dogs Help Give Kids Reading Confidence,” 11/2014). Service dogs are even sometimes used in schools to identify and help stressed-out students (“Stressed? This Dog May Help,” New York Times, 10/2014), though service dogs are in a different category than therapy dogs; they’re trained more extensively and covered under the A.D.A. Sudo (and her new friend Daisy) with her official Dog B.O.N.E.S. bandanna at the end of the third class. Here in Massachusetts, there’s an organization called Dog B.O.N.E.S. (Dogs Building Opportunities for Nurturing and Emotional Support) that trains volunteer handler/dog teams and helps organize visits to schools, libraries, nursing homes, assisted living facilities, hospitals, colleges and universities, and other organizations that request a team. This winter, despite the frequent blizzards, my husband and I and our greyhound, Sudo, completed a three-session training course with Dog B.O.N.E.S. Unfortunately, Sudo is a little skittish with children and wouldn’t be a good “read dog” for younger kids, but I hope that some of our classmates, instructors, or other Dog B.O.N.E.S. volunteers can visit our library this year. Meanwhile, we’ll look for opportunities to bring her to visit adults who might enjoy the soothing company of a calm, friendly dog. Massachusetts libraries interested in having a team from Dog B.O.N.E.S. visit should contact the organization through the e-mail address on their website. Dog B.O.N.E.S. teams are insured in Massachusetts.